ENVIROTECH'S EMERGENCY MOLD REMEDIATION AT AN AREA HOSPITAL | Envirotech Clean Air, Inc.
Envirotech Clean Air recently cleaned and restored the HVAC mechanical system and ductwork at an area hospital, after heavy mold growth was found in several areas. 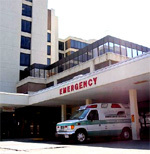 The project took the Envirotech team into the emergency room, ICU and several other critical care areas. Work was performed on an emergency basis over long weekends and extended several weeks, with the Envirotech team working nights and weekends. Problem: Severe mold growth on the interior supply ductwork serving hospital surgical and ICU suites. 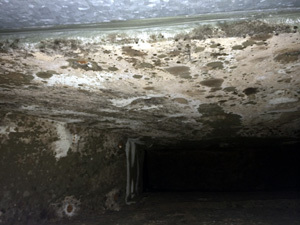 Remediation: The internal fiberglass lining in the ductwork removed and the sheet metal ducts were scraped, cleaned and scrubbed with a fungistat. 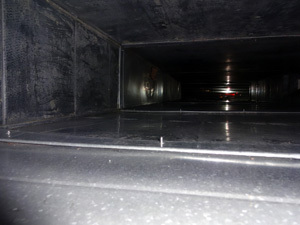 The interior ductwork and the air were tested by an independent industrial hygiene consultant, and the exterior of the ductwork was wrapped. Coordination: The project was performed over one weekend on an emergency basis with 24 technicians and supervisors. The project was coordinated with the HVAC Mechanical contractor, hospital facility personnel, and the independent industrial hygiene consultant. This entry was posted in Boston MA, Central MA, Hospitals, Mold Removal, Uncategorized by admin. Bookmark the permalink.